The Edelkrone SliderPLUS X Long is the largest of their “family” of SliderPLUS models. This model features a unique Dolly in/out range which is what appealed to us about the slider. Essentially, the slider has a shorter track to it which makes it easier to store and carry around but when the head unit is released via the instant locking button, the track can slide back and forth along the head unit, giving you a tracking shot double the length of the track. The slider gives 2.9ft of movement for the camera which is quite substantial. Setting the SliderPLUS onto our tripod was, we admit, difficult but it was nothing to do with the SliderPLUS. Our tripod head took too long to break down to then reassamble with the SliderPLUS so we purchased a new tripod head. You put the SliderPLUS on the top of your tripod and screw it onto the bowl via a dial (only on certain models), then, the tripod head unit goes on top of the SliderPLUS and screws into place via a pop up screw. Easy really. There’s also fold down legs on the SliderPLUS if you want to put it on the ground and get shots as well. 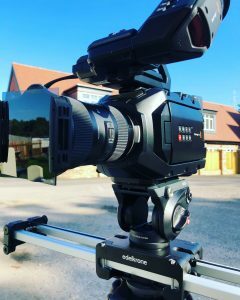 The SliderPLUS movement is smooth straight out of the box – we purchased the Steady Module to assist with creating smooth shots but haven’t felt the need to use it yet as we have been happy with what we got. The URSA Mini 4.6K, our main camera, is slightly too heavy for the slider when pushed to the furthest reaches that the track can go to. But saying that, any slider is going to cause a tip on the tripod when a weight is balanced on an unsupported track which hangs out over the footprint of the tripod so it’s not really a surprise this happened. However, by removing the EVF and handle on the URSA, it was easier to use due to the decreased weight. The EVF is great but you can’t look through it and do a slider move so we felt we didn’t need it as the camera has a screen which folds out. We did a test shoot with actress Emily Beach and Silvertips’ very own Mike, at Max’s Diner in Horsham. You can see this short test below and get a feel for the kind of movement you can get with the slider. We’re really impressed by the SliderPLUS X Long, how easy it is to set up, use and the results you get from it. We are looking forward to getting it out on more shoots soon. Posted in Blog and tagged edelkrone, sliderPLUS X Long, slider.